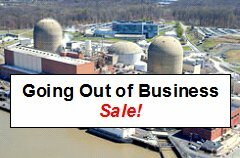 In the last few years, nuclear plant owners have shut down or scheduled for shutdown 17 units totaling over 14,000 MW. Over half of these units had (or have) nuclear safety culture (NSC) issues sufficiently noteworthy to warrant mention here on Safetymatters. We are not saying that NSC issues alone have led to the permanent shutdown of any plant, but such issues often accompany poor decision-making that can hasten a plant’s demise. Following is a roll call of the deceased or endangered plants. NSC issues provide windows into organizational behavior; the sizes of issues range from isolated problems to systemic weaknesses. This one doesn’t exactly belong on the list. Entergy scheduled it for shutdown in Jan. 2017 but instead it will likely be purchased by a white knight, Exelon, in a transaction brokered by the governor of New York. With respect to NSC, in 2012 FitzPatrick received a Confirmatory Order (CO) after the NRC discovered violations, the majority of which were willful, related to adherence to site radiation protection procedures. This plant shut down on Oct. 24, 2016. According to the owner, the reason was “market conditions.” It’s hard for a plant to be economically viable when it was shut down for over two years because of scheduled maintenance, flooding, a fire and various safety violations. The plant kept moving down the NRC Action Matrix which meant more inspections and a third-party NSC assessment. A serious cultural issue was how the plant staff’s perception of the Corrective Action Program (CAP) had evolved to view the CAP as a work management system rather than the principal way for the plant to identify and fix its problems. Click on the Fort Calhoun label to pull up our related posts. Units 2 and 3 are scheduled to shut down in 2020 and 2021, respectively. As the surrounding population grew, the political pressure to shut them down also increased. A long history of technical and regulatory issues did not inspire confidence. In NSC space, they had problems with making incomplete or false statements to the NRC, a cardinal sin for a regulated entity. The plant received a Notice of Violation (NOV) in 2015 for providing information about a licensed operator's medical condition that was not complete and accurate; they received a NOV in 2014 because a chemistry manager falsified test results. Our May 12, 2014 post on the latter event is a reader favorite. This plant had a long history of technical and NSC issues. It is scheduled for shutdown on Oct. 1, 2018. In 2015 Palisades received a NOV because it provided information to the NRC that was not complete and accurate; in 2014 it received a CO because a security manager assigned a person to a role for which he was not qualified; in 2012 it received a CO after an operator left the control room without permission and without performing a turnover to another operator. Click on the Palisades label to pull up our related posts. This plant is scheduled for shutdown on May 31, 2019. It worked its way to column 4 of the Action Matrix in Sept. 2015 and is currently undergoing an IP 95003 inspection, including an in-depth evaluation of the plant’s CAP and an independent assessment of the plant’s NSC. In 2013, Pilgrim received a NOV because it provided information to the NRC that was not complete and accurate; in 2005 it received a NOV after an on-duty supervisor was observed sleeping in the control room. These units ceased operations on Jan. 1, 2012. The proximate cause of death was management incompetence: management opted to replace the old steam generators (S/Gs) with a large, complex design that the vendor had never fabricated before. The new S/Gs were unacceptable in operation when tube leakage occurred due to excessive vibrations. NSC was never anything to write home about either: the plant was plagued for years by incidents, including willful violations, and employees claiming they feared retaliation if they reported or discussed such incidents. This plant shut down on Dec. 29, 2014 ostensibly for “economic reasons” but it had a vociferous group of critics calling for it to go. The plant evidenced a significant NSC issue in 2009 when plant staff parsed an information request to the point where they made statements that were “incomplete and misleading” to state regulators about tritium leakage from plant piping. Eleven employees, including the VP for operations, were subsequently put on leave or reprimanded. Click on the Vermont Yankee label to pull up our related posts. The following plants have not appeared on our NSC radar in the eight years we’ve been publishing Safetymatters. We have singled out a couple of them for extremely poor management decisions. Crystal River basically committed suicide when they tried to create a major containment penetration on their own and ended up with a delaminating containment. It ceased operations on Sept. 26, 2009. Kewaunee shut down on May 7, 2013 for economic reasons, viz., the plant owner apparently believed their initial 8-year PPA would be followed by equal or even higher prices in the electricity market. The owner was wrong. Rounding out the list, Clinton is scheduled to shut down June 1, 2017; Diablo Canyon 1 and 2 will shut down in 2024 and 2025, respectively; Oyster Creek is scheduled to shut down on June 1, 2019; and Quad Cities 1 and 2 are scheduled to shut down on June 1, 2018 — all for business reasons. Bad economics (low natural gas prices, no economies of scale for small units) were the key drivers of these shutdown decisions but NSC issues and management incompetence played important supporting roles. NSC problems provide ammunition to zealous plant critics but, more importantly, also create questions about plant safety and viability in the minds of the larger public.